Earlston is setting for an action-packed day on Sunday as round eight of the Kings of the 7s rolls into the picturesque setting at the Haugh. Earlston 7s have become one of the most popular sporting events in the Border calendar and are a great advert for the game on both a sporting and social level. On show will be fiercely competitive sporting contests played at a breathtaking pace with skill and scoring in abundance. The hosts are joined by all the main contenders for the Kings of the 7s crown, and also by junior sides Hawick Quins, Duns and St Boswells, who will all be eager to test themselves against the best club sevens players in the country and relish the chance to cause an upset. 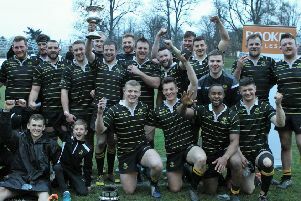 Melrose will be looking to lift the Earlston cup for an unprecedented sixth year in a row but will face stiff competition from city sides Watsonians and Edinburgh Accies, along with current tournament leaders Jedforest. Acknowledging the support of Live At The Bar as main sponsor, sevens convenor Richard Aitchison also paid tribute to the volunteers at the club who help ensure the successful running of the tournament, as well as the Borders Rugby Referees Society for officiating once again, and to all the club’s sponsors. Action starts at 1pm and the first-round draw is as follows: Keslo v Hawick, Edinburgh Accies v Selkirk, Lasswade v Duns, Jedforest v Berwick, Melrose v Hawick Quins, Gala v St Boswells, Earlston v Peebles, Watsonians v Edinburgh University.